These Pet Rescue level 293 cheats and tips will help you beat level 293 of Pet Rescue. 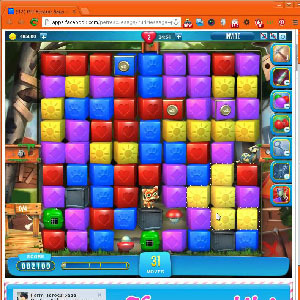 The objective of Pet Rescue level 293 is to save 4 pets and get 13,000 points. In Pet Rescue Saga level 293, the first thing you need to do is release your center key. To do so, use one of the middle blasts to shoot that down. In turn, one will activate the other and also release the top and bottom animals from their cages. Now, align your other line blasts to shoot through the animal cages in the right and left column. From there, your key and all of your animals should be free. Once the board opens up you can play through as normal and make matches to drop animals. You may find get lucky and end up dropping a bomb. And i mean, just one bomb. Therefore, since it is rare, you should save it and bring it to the bottom of the level in case you wind up with an isolated animals that needs to be rescued.